Asset Bank is not a one-size-fits-all solution, but instead recognises that different clients have different needs. As a result Asset Bank has grown to be highly flexible and customisable, allowing you to create the site you want and communicate clearly with your user base. With the click of a button, Asset Bank can be viewed in Edit Mode. This provides an easy way for you to quickly change welcome text, content managed pages and the copy on links or buttons. Ensuring the language you present to users resonates with them helps improve user experience. We can adjust the logo, colour-scheme and fonts in Asset Bank to match your organisation's branding. If you are hosting it yourself and you have the skills in-house you can do this yourself. You can publish news items directly on your homepage, to inform users of changes to your site or draw attention to new content. Articles can be written in advance and published via the admin interface. You can also decide which users can see the articles and if they should also appear in specific category locations as well as on the homepage. Asset Bank automatically shows a stream of recently added assets, keeping users up to date with new content. 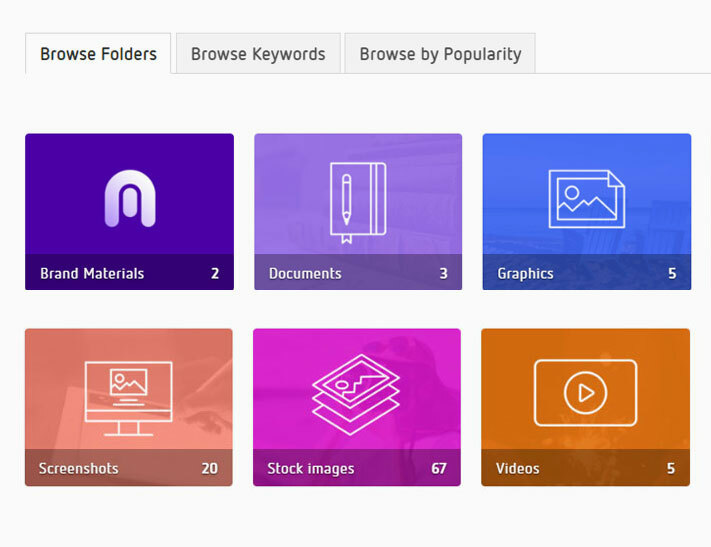 In addition, admins can promote collections of assets onto the homepage, ensuring users are aware of useful materials when they log in. Create brand new custom pages using the built-in editor and have these pages appear in the main navigation. You can drag and drop to re-order and decide what position they appear in the menu, and also decide which groups can see these new pages. As well as content managed pages you can also add in links, allowing you to point to specific areas in Asset Bank or to external sites. 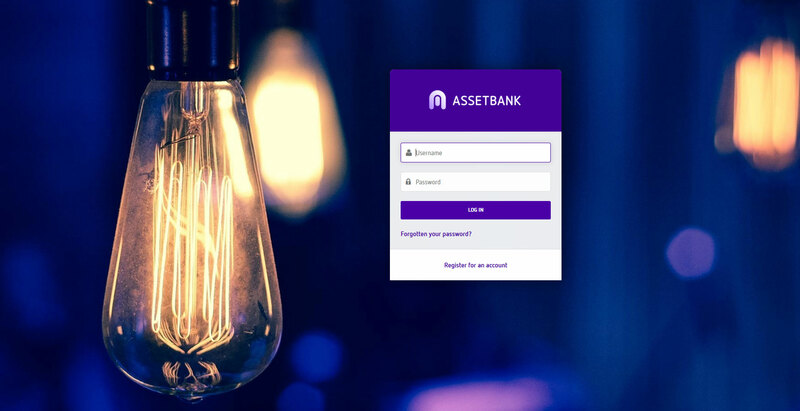 Asset Bank allows you to create as many attributes as you need in order to help uniquely identify your assets. 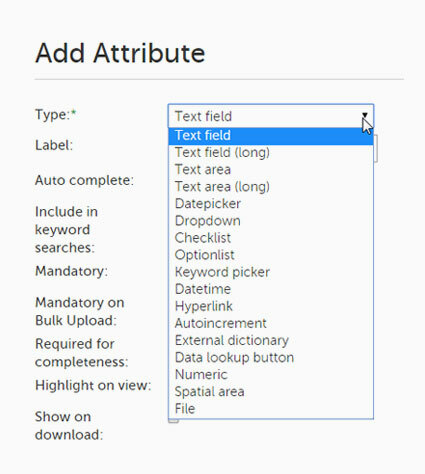 There is a default set that are already configured, but you can add new attributes of various types including: text field, text area, numeric, check list, option list, drop down, date, date/time, keyword picker, auto-increment, GIS, file and hyper-link. The keyword picker allows you to upload a heirarchical controlled vocabulary. Uploaders then choose tags from this masterlist. Decide which attributes you want in the system and what order they should appear in. Set up a folder structure to organise your assets in a way that fits your needs. 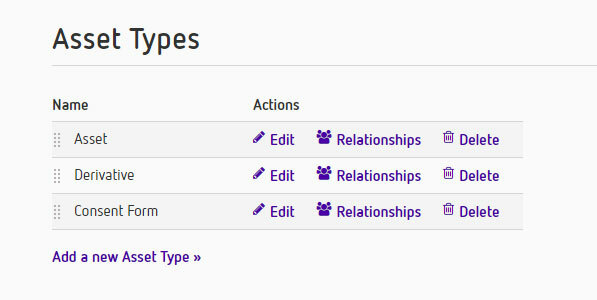 Set up 'Asset Types' to allow you to have different sets of attributes for different types of asset. Note, this feature is for Enterprise versions of Asset Bank only. For organisations that need a lot of attributes they can be grouped under collapsible headings.